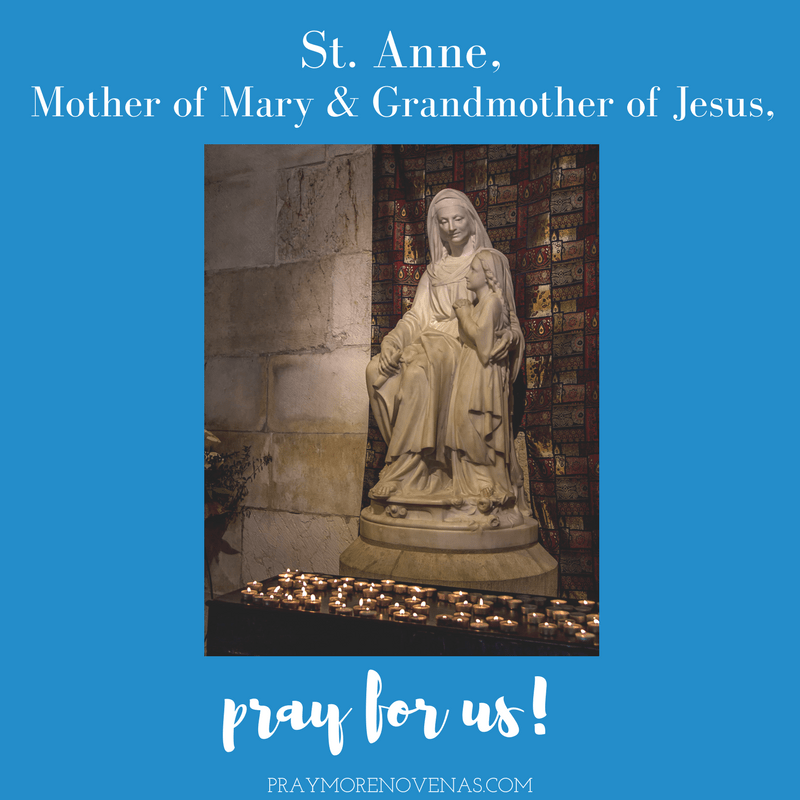 Here’s the Final Prayer of The St. Anne Novena! Thank you St Anne, St Monica, St Joseph, St Anthony and Blessed Mother. Please keep my children in your prayers: Help Alie have confidence and strength in her decisions,and she get into Jan 22 Flight class, Vicki get accepted into a Grad school for the fall 2019, Dot and Nick have many blessings on their marriage. Mr Marciano have an easy surgery quick healing and cancer free. I asked St. Monica and Our Lord to take away my cousin’s pain and for he and his family be reunited. Thank you St Monica and Our Lord for your help and guidance. Dear St Monica … please intercede with my children who have left the church, that they too will see the need for God and his church in their lives. Also my little granddaughter hasn’t been baptized so please inspire my daughter to see the importance of raising her daughter as a child of God and to bring her up in the faith and to nuture all the blessings and graces that God has given to her. Amen. Thank you for your intercession for my intentions, as my sister got her job on your feast day, thanks be to God for listening to our prayer and your prayer on our behalf! St Anne intercede for me in my marriage there is no unite, pray for my husband he’s an alcoholic to turn his life to Jesus Christ, pray for my children to be protected. I thank you for listening, and I pray for our Middle son that he will be blessed with a job soon, and that he will seek help in counseling for his depression. Please bless him with a nice young female friend. I humbly pray for our oldest son that he may be blessed with a nice young woman to be his future wife, and that he will be successful in his job. I pray for our daughter that she too will be successful in her new job, and that this medicine she is taking for her pituitary tumor will heal, and she will be healthy. Thank you so much for the love you have given us. I’m seeking for compassion. I’m fighting for my rights. I was cheated, bitten and let down by a man who is about to marry another woman. I pray and ask my prayers to reach him and fill him with goodness for him to be changed and back to me. Happy Feast Day,St.Anne❤Thank you,St.Anne for your intercession to Our Lord……That my sister Jen’s eye operation was successful but please continue to pray for her speedy recovery( after the op)….Pray for my brother S in his health condition to improve as he got eating difficulties & is now residing in nursing home….Praying for G in her health & work…..As for me I am praying for better heath condition…. Thank you so much, Saint Anne, for your intercession in obtaining the favor we prayed for!! My goddaughter’s husband has been out of work since February. I prayed this novena that he would obtain a good job. And I asked St. Anne that as a sign that it was granted through her intercession, that he get the job before the end of the novena. Yesterday, the ninth day, he received a call confirming an excellent position as a regional manager for an international company! He will sign the contract tomorrow. Thank you again, Saint Anne, Blessed Mary and Jesus!! Today I am a lost for words, I am preparing for an interview on Monday and I am finding it hard to find the right words to say, I ask for your help your protection and guidance during this stressful time. I pray you instil within me the right words to say, this job has been something I have been waiting for in a long time, your will be done Lord. I your precious name I pray. I’m so happy, since I started praying novena with you. Asking that my work be made successful, every month I’m able to register at least one child, the number us growing daily. Thank you very much. My new company had been successful registered, and today we recieved a whole lot of office equipment. Given to us for free to use to the benefit of our company, I strongly this couldn’t have happened without your support in my prayers, please continue sending me these novena, they have a big impact in my life in general. I’m relaxed and content. Because I know with God everything is possible. Glory be to God. Thank you, St Anne, for the safe and healthy birth of my 3rd grandchild on Tuesday 7/24. Continue to intercede for the protection of my grandchildren and children. Pray that I may be a good grandmother and guide them to be devout Catholics. PRAISE BE TO GOD! AMEN! I ask please pray for our daughter going to mediation today for her and our granddaughter’s protection. I pray the courts are favorable for them. At.Ann, pray for us. St. Anne, please intercede for salvation/conversion of all our family members, my husband’s better paying job, rekindling/restoration of all marriages in our families, especially, my marriage, for our daughter to get accepted to med school, successful eye surgery & recovery of our granddaughter, a big financial blessing & be debt free, and all other intentions we hold in our hearts. Thank you & God bless you. I pray for strength and guidance for my son, Galen, who has left for his first army assignment. Praying for a happy, healthy relationship with marriage and a child. Please heal and bring C and I back together for the highest good with love, friendship, marriage and family. Thank you St. Anne for your intercessions for me. I ask that you continue to pray for my nephew and his wife to have a long, strong, healthy and happy marriage and they will return to the Catholic Church/Faith. and their future children will be happy, healthy, normal, and Cassie’s pregnancies and deliveries will smooth, fast and without complications. Pray for Gee to be protected from any evil that may surround her in her old age. And a little (selfish) prayer for me, that my nephew and his new wife will call and visit me more often and on a regular basis. Thank you St. Anne for your intercession to Christ for my requests and the others who posted or prayed to you. Please for me to see God’s glory in all my life . I pray for families, the sick and elderly, may your prayers and blessings always be around us. I pray financial breakthrough. Let all my debts be lessened to payable and manageable amounts so that I can amply provide for my family through your intercession. May God’s name be lifted high always. St. Anne you took my prayers, silent cries & heart’s desire to our beloved sweet Jesus. And I am ssssoooo grateful, cannot thank God enough for my prayer being answered. You pray for a fatherless child. God knows your true intentions. Dear St Ann, please pray for my family so that prayer is the first and most impotant duty in our lives. Receive regulary the sacraments of penitence and Holy Communion for Almighty God to provide us with all our bodily needs. Amen.